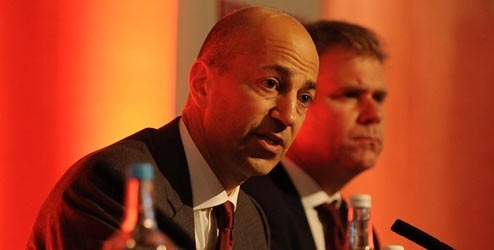 Arsenal CEO Ivan Gazidis told us the supporters trust that it will be an active summer at the Emirates. I was present with around 200 other supporters to listen to what Ivan had to say. As I expected, he did not give much away and it felt he was worried about what would be in the morning papers so all we could do was read between the lines. Gazidis mentioned an ‘active summer’ three times I seem to recall he talked about a lack of experience in seeing games out and that was the major clue about what sort of players will be bought. Gazdis was not going to be caught up with individuals but said Arsenal have been in touch with many clubs about many players. I do think some important issues were raised and will be looked into. The issue of reserve games being played behind closed doors during the winter months cropped up and people that have been to reserve games will agree there is always a good atmosphere and a good chance to see the young talent on show but also talk to other supporters about club issues. The argument from Gazidis was that it helps player development to play on the pitches at the training ground but I also think playing in front of a crowd will aid player development so I guess a balancing act has to be found. The Arsene Wenger question was asked several times. Someone asked if removing Mr Wenger from the financial aspects of the club would help but Gazidis rejected the idea because he felt Mr Wenger needs to be involved as he is the manager and knows what the club needs. In terms of the future of the manager, a lot depends on if he loses the supporters and if he did; it may be hard to keep him at the club. I am firmly behind Arsene Wenger and I think he knows what he has to do this summer and I really hope we win something this season so we do not have to even consider his future this time next year. There was a good debate after the meeting too and the passion for the club is as good as ever.